studied by itself. It is a combination of many disciplines and many approaches to the problem of understanding the response of materials to forces. On the one hand is the approach used in strength of materials and in the theories of elasticity and plasticity, where a metal is considered to be a homogeneous material whose mechanical behavior can be rather precisely described on the basis of only a very few material constants. This approach is the basis for the rational design of structural members and machine parts. The topics of strength of materials, elasticity, and plasticity are treated in Part One of this book from a more generalized point of view than is usually considered in a first course in strength of materials. The material in Chaps. 1 to 3 can be considered the mathematical framework on which much of the remainder of the book rests. For students of engineering who have had an advanced course in strength of materials or machine design, it probably will be possible to skim rapidly over these chapters. However, for most students of. metallurgy and for practicing engineers in industry, it is worth spending the time to become familiar with the mathematics presented in Part One. The theories of strength of materials, elasticity, and plasticity lose much of their power when the structure of the metal becomes an important consideration and it can no longer be considered a homogeneous medium. Examples of this are in the high-temperature behavior of metals, where the metallurgical structure may continuously change with time, or in the ductile-to-brittle transition, which occurs in carbon steel. The determination of the relationship between mechanical behavior and structure (as detected chiefly with microscopic and x-ray techniques) is the main responsibility of the mechanical metallurgist. When mechanical behavior is understood in terms of metallurgical structure, it is generally possible to improve the mechanical properties or at least to control them. 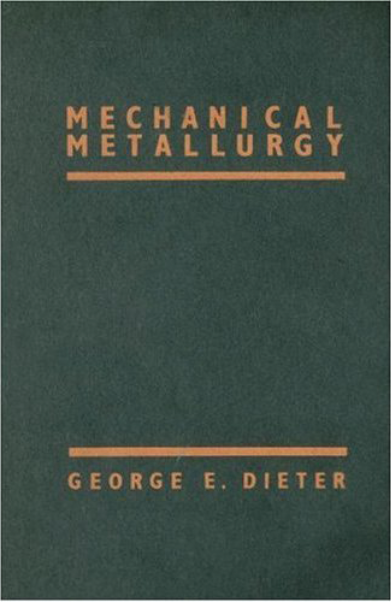 Part Two of this book is concerned with the metallurgical fundamentals of the mechanical behavior of metals. Metallurgical students will find that some of the material in Part Two has been covered in a previous course in physical metallurgy, since mechanical metallurgy is part of the broader field of physical metallurgy. However, these subjects are considered in greater detail than is usually the case in a first course in physical metallurgy. In addition, certain topics which pertain more to physical metallurgy than mechanical metallurgy have been included in order to provide continuity and to assist non-metallurgical students who may not have had a course in physical metallurgy. 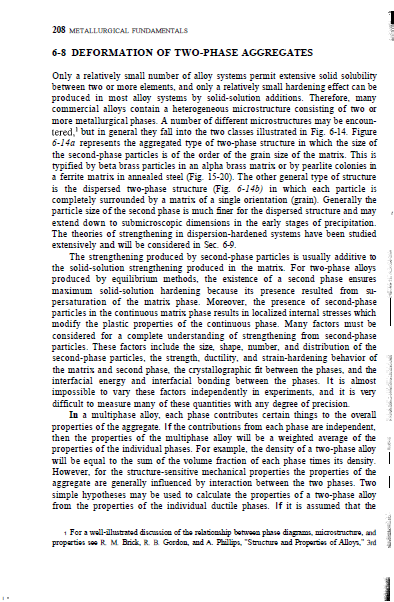 The last three chapters of Part Two are concerned primarily with atomistic concepts of the flow and fracture of metals. Many of the developments in these areas have been the result of the alliance of the solid-state physicist with the metallurgist. This has been an area of great progress. The introduction of transmission electron microscopy has provided an important experimental tool for verifying theory and guiding analysis. 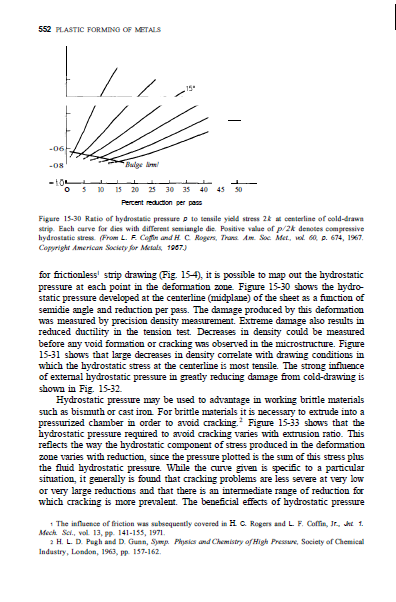 A body of basic dislocation theory is presented which is useful for understanding the mechanical behavior of crystalline solids. Basic data concerning the strength of metals and measurements for the routine control of mechanical properties are obtained from a relatively small number of standardized mechanical tests. 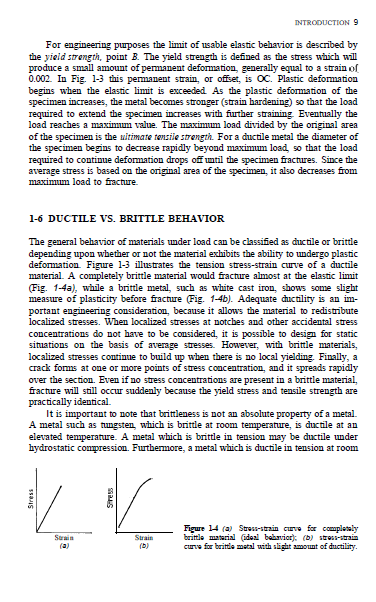 Part Three, Applications to Materials Testing, considers each of the common mechanical tests,. not from the usual standpoint of testing techniques, but instead from the consideration of what these tests tell about the service performance of metals and how metallurgical variables affect the results of these tests. Much of the material in Parts One and Two has been utilized in Part Three. It is assumed that the reader either has completed a conventional course in materials testing or will be concurrently taking a laboratory course in which familiarization with the testing techniques will be acquired. Part Four considers the metallurgical and mechanical factors involved in forming metals into useful shapes. Attempts have been made to present mathematical analyses of the principal metalworking processes, although in cert cases this has not been possible, either because of the considerable detail required or because the analysis is beyond the scope of this book. 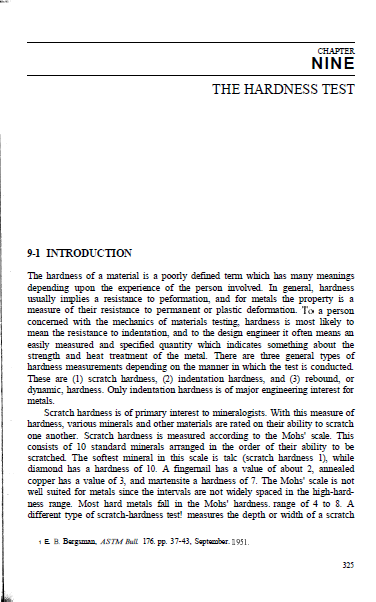 No attempt has been made to include the extensive specialized technology associated with each metal working process, such as rolling or extrusion, although some effort has been made to give a general impression of the mechanical equipment required and to familiarize the reader with the specialized vocabulary of the metalworking field: Major emphasis has been placed on presenting a fairly simplified picture of the forces involved in each process and of how geometrical and metallurgical factors affect the forming loads and the success of the metalworking process. direction or orientation. A property which varies with orientation with respect to some system of axes is said to be anisotropic. While engineering materials such as steel, cast iron, and aluminum may appear to meet these conditions when viewed on a gross scale, it is readily apparent when they are viewed through a microscope that they are anything but homogeneous and isotropic. Most engineering metals are made up of more than one phase, with different mechanical properties, such that on a micro scale they are heterogeneous. Further, even a single-phase metal will usually exhibit chemical segregation, and therefore the properties will not be identical from point to point. Metals are made up of an aggregate of crystal grains having different properties in different crystallographic directions. The reason why the equations of strength of materials describe the behavior of real metals is that, in gneral, the crystal grains are so small that, for a specimen of any macroscopic volume, the materials are statistically homogeneous and isotropic. However, when metals are severely deformed in a particular direction, as in rolling or forging, the mechanical properties may be anisotropic on a macro scale. Other examples of anisotropic properties are fiber-reinforced composite materials and single crystals. Lack of continuity may be present in porous castings or powder metallurgy parts and, on an atomic level, at defects such as vacancies and dislocations. stress-strain relationship that still satisfies the definition of an elastic material. Elastic deformations in metals are quite small and require very sensitive instruments for their measurement. Ultrasensitive instruments have shown that the elastic limits of metals are much lower than the values usually measured in engineering tests of materials. As the measuring devices become more sensitive, the elastic limit is decreased, so that for most metals there is only a rather narrow range of loads over which Hooke's law strictly applies. This is, however, primarily of academic importance. Hooke's law remains a quite valid relationship for engineering design. covered here should, however, provide a background for intelligent reading of the more mathematical literature in mechanical metallurgy. It should be recognized that the equations describing the state of stress or strain in a body are applicable to any solid continuum, whether it be an elastic or plastic solid or a viscous fluid. Indeed, this body of knowledge is often called continuum mechanics. The equations relating stress and strain are called constitutive equations because they depend on the material behavior. In this chapter we shall only consider the constitutive equations for an elastic solid. variety of forging machinery which is capable of making parts ranging in size from a bolt to a turbine rotor or an entire airplane wing. Most forging operations are carried out hot, although certain metals may be cold-forged. Two major classes of equipment are used for forging operations. The forging hammer, or drop hammer, delivers rapid impact blows to the surface of the metal, while the forging press subjects the metal to a slow-speed compressive force. The two broad categories of forging processes are open-die forging and closed-die forging. Open-die forging is carried out between fiat dies or dies of very simple shape. The process is used mostly for large objects or when the number of parts produced is small. Often open-die forging is used to preform the workpiece for closed-die forging. In closed-die forging the workpiece is deformed between two die halves which carry the impressions of the desired final shape. The workpiece is deformed under high pressure in a closed cavity, and thus precision forgings with close dimensional tolerances can be produced.